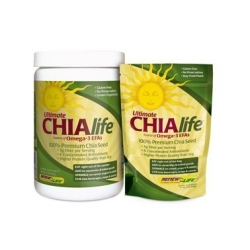 Ultimate CHIAlife 100% premium chia seeds provide a nourishing blend of dietary fiber, beneficial Omega-3 fatty acids and other nutrients for a power-packed energy boost at home or on the road. Double tested and certified to ensure the highest level of purity and quality, our organically grown chia seeds add a pleasant, nutty flavor to all your favorite foods and beverages. Sprinkle them on soups and salads, add them to yogurt and granola, bake them right into breads and muffins, or eat them straight out of the bag for a nutritious, great-tasting high fiber snack. Chia is the nutrient-dense seed of the Salvia hispanica plant. Recognized by the U.S. Food and Drug Administration as a "food with an established history of safe consumption," chia is the richest known whole food source of both fiber and Omega-3 fatty acidsbeneficial polyunsaturated fats that have been shown to promote healthy cardiovascular and neurological function‡. 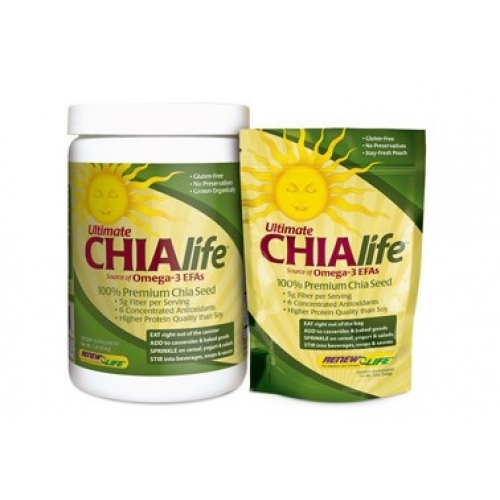 In addition, chia seeds provide a complete source of dietary protein, containing all nine of the essential amino acids. Due to its significant antioxidant properties, chia is considered a High- ORAC Food by the U.S. Department of Agriculture. Such foods have earned high scores in an analysis called Oxygen Radical Absorbance Capacity, or ORAC, which measures the total antioxidant power of foods and other substances.